Frigidaire is teaming up with actress and mom Jennifer Garner to support Save the Children, a charitable organization striving to create lasting change in the lives of children in need in the United States and around the world. They've created an easy, fun way to give back to kids in need: Make Time for Change. Each day you visit the Make Time for Change website and play the Spin and Win game, you will be entered to win great prizes like gift cards to Lowe's and Best Buy- all meant to give you some extra time and money to do something with your family. 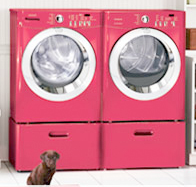 You'll also be entered to win a brand new Frigidaire Affinity washer and dryer (drool!) but best of all, Frigidaire will donate $1 for each gameplay to Save the Children, up to $15,000 as part of their $250K commitment to Save the Children's CHANGE (Creating Healthy, Active, Nurturing, Growing-up Environments) program, which is dedicated to providing nutritious snacks and promoting healthier lifestyles for children living in poverty in the United States.